Emerald: Nigeria gets 1st female Chief Justice of Nigeria, CJN! Nigeria gets 1st female Chief Justice of Nigeria, CJN! 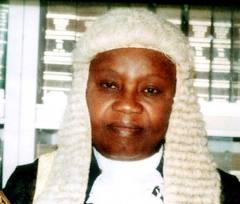 President Goodluck Jonathan has sent the name of Justice Aloma Mariam Mukthar to the Senate for confirmation as the Chief Justice of Nigeria. If confirmed, she would be the first female in the history of Nigeria to occupy that post as the tenure of the current CJN expires this month.